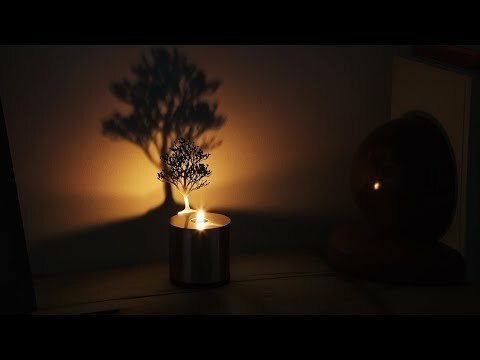 These Made in the USA lumen candles are eye-catching with the lights on, but when you turn the lights out, you’ll see beautiful a shadowy tree projection on the wall. It reminds us of leaves rustling in the wind. Designed by Brooklyn-based installation artist Adam Frank, these tiny stainless steel luminaries create a room full of ambience. Cute, but very, very small. Brooklyn-based installation artist, Adam Frank, experiments with light to create shadowy magic. His Made in the USA lumen candles burn clean and cast intricate designs on your wall. Each stainless steel luminary has a tiny tree attached. It comes to life when you turn the lights off. The projected silhouette almost gives the impression of leaves rustling in the wind. Adam Frank lumen candles are fueled by clean-burning liquid and come equipped with two containers of it to keep the light—and shadows—going. When it’s not lit, this candle adds a minimalist touch, and once you light it, it makes a room-sweeping difference.